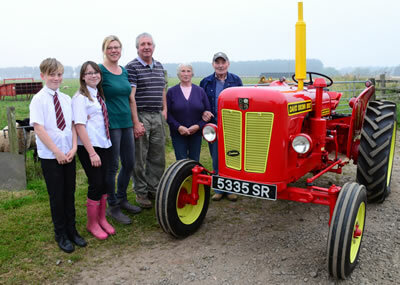 Four generations of the Nicoll family have been at Newton of Fothringham Farm, part of Fothringham Estate near Forfar in Angus. The farm was originally a dairy but the Nicoll family have always run a mixed arable enterprise with beef, sheep and malting barley their primary focus. 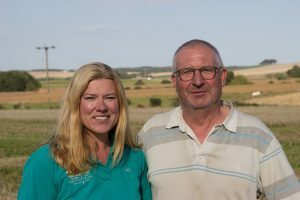 However, since Graeme and Louise moved into the farmhouse in April 2001 and took over the day to day running of the farm from Graeme’s parents, there has been a great deal of change. until the 90s when Louise fell for farmer Graeme whilst she was studying in Oxford. The uniting of the Nicoll & Robertson Clan took place the following year and brought with it a strong heritage of farming dating back to the 1700s. Our family history has the Nicolls farming in Angus whilst Graeme’s maternal line of Pattullo and Louise’s Robertson roots were both in Glamis and Perthshire. Louise’s maternal kin hail in part from Ayrshire with the McDowalls, and with the Fotheringhams whom initially were in Fife before migrating to Perthshire and then onto Angus. Did you spot the surprise link with the farm? Louise’s Granddad Fotheringham and the Laird of our Estate is a Fothringham. There is a slight change in the spelling but as I understand it the surnames have the same origin and probably came from Hungary hundreds of years ago. Such a coincidence! The ancestry research we have undertaken has provided us with the local knowledge to help our guests with their own research so if you have questions before or during you stay please ask so we can try and direct you along the right path. Our first marital home was the cottage on the farm which in 2009 we refurbished and established as a self catering holiday cottage. With many good memories and the knowledge of how comfortable it is we are delighted to now be able to offer it for guests, to enjoy as much as we did, for self catering or bed and breakfast. We have refurbished again at the end of 2014 in line with our recent rebranding to “Newton Farm Holidays.” A key element for this change was the influence of the Scottish countryside to enhance our accommodation offering and we are delighted with the results, reflected both in the cottage and the farmhouse providing a relaxing environment, so much so we feel like booking in ourselves for a week! After moving into the farmhouse, followed by the very premature birth of twins, Scott and Iona, in 2002, I found myself struggling to juggle my career, as a medical hospital sales specialist, my home life as a new mother and wife, and the work I also did on the farm including the farm accounts. We decided that being at home to assist Graeme and look after the kids would be the best scenario. Never idle though I wanted to be able to contribute more to the farm and missed the people contact I thrived on before. When my mother and father called and asked me to take a few guests during the 2006 Glamis Extravaganza as their own B&B in Forfar was fully booked we relished the challenge and now approaching our 13 year anniversary we strive to continually improve our guest accommodation and the authentic farm experience we offer. The joy we have from meeting guests from all over the world and learning about their lives is unique and great for our children. We now have many friends who return every year, something to always look forward to. We pride ourselves on customer care and adding value to all our guests’ stays with many extras available. I haven’t found anywhere else offering what we do with the authentic working farm, nature trails, the farm tour often accompanied by one of our friendly animals, the personal family service, the many different animals you can enjoy and the food experience at breakfast. Where else can you open your curtains in the morning to unbroken stunning Southerly views and gaze on a micropig grazing in outside your window, and the alpacas, sheep, goats, or Highland cows in the field?